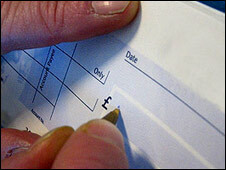 New technology allowing customers of UK banks to manage their accounts through their mobile phone is being introduced. 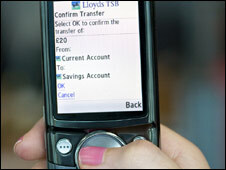 Lloyds TSB will next month be the first to allow customers to transfer funds between accounts within the same bank via their mobile. The software already exists which would allow people to make payments to other people's accounts, but the banks have chosen to bring in this system slowly. Industry representatives say security must be ensured before it comes in. Customers of a number of High Street banks can already use their mobile phones to check their account balance and check the details of their last six transactions. The system, run by a mobile money network called Monilink, also allows parents to top up the credit on their children's pay-as-you-go mobile phones via their own. A text alert service for when customers are within £50 of their balance limit is also in place. This new development will allow consumers to download some simple software to phones with internet access and a colour screen. They will then enter a six-digit security code before they can view their balance or transfer money between their own Lloyds TSB accounts. It will cost £2.50 a month, although it will be free to some premium banking customers, as well as being free to student account holders until October 2009. "Just as internet banking has taken the country by storm over the past decade, mobile banking is now set to change the way we manage our money," said Catherine McGrath, director of current accounts at Lloyds TSB. With 95% of the UK population owning a mobile phone this was expected to become a "key channel" for people to manage their money, according to Ben Evetts, spokesman for Monitise which created the Monilink system. He said the technology was already in place to offer a bank account to bank account mobile phone service. He expected this to primarily be used for basic payments, with consumers preferring to set up more long-term standing orders or complicated transactions via their computers. But the implementation of such a scheme will be gradual, and as yet not entirely certain. The UK Payments Service invited offers earlier this year from companies willing to provide the technology. Sandra Quinn, of UK payments association Apacs, said that industry agreement would come at the start of 2009 at the earliest. It would take a further 18 months for it to come into force. The main reasons for the timescale were the banks' insistence on watertight security for the system, which would effectively use a mobile number as proxy for a bank account number. The system would also have to be easier for customers to use than anything provided at present. But she stressed that the recent global turmoil within the banking sector meant they currently had other pressing priorities. "Industry innovation is unlikely to be at the top of banks' agendas at the moment," she said.